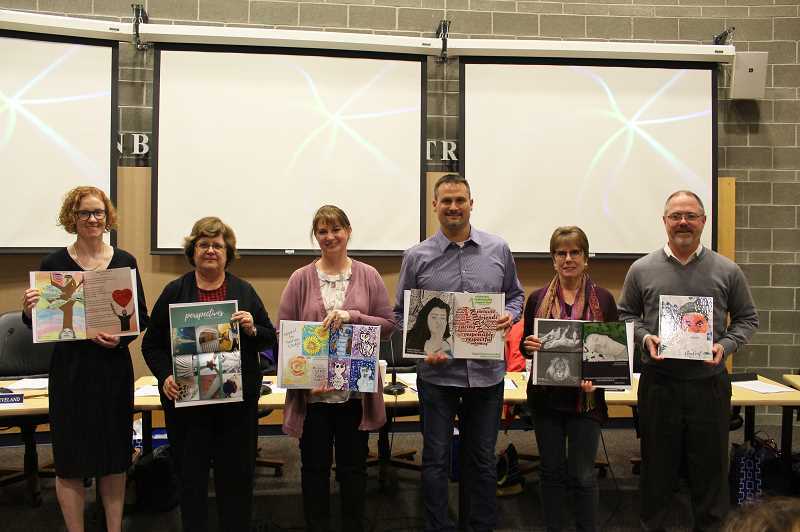 Since January is school board recognition month, district staff recognized Canby's school board members at the January meeting. "We really are so fortunate to have a board that is committed to the students and staff in the community here in Canby," Superintendent Trip Goodall said to the board members. "I say it all the time. I just don't say things just to say things; I really believe that you guys go beyond expectations for a board. You're always there when we need to help make good decisions for the kids." Canby's school board consists of Chair Rob Sheveland, Angi Dilkes Perry, Diane Downs, Sara Magenheimer, Tom Scott, Andrea Weber and Mike Zagyva. These board members received a special gift this year. Communications Coordinator Autumn Foster worked with other staff members to put together a hardbound book of artwork by students from every school in the district. "In this project, we really tried to collect artwork that had intense reflection," Foster said. "And we wanted to give you an idea about our students—a real deep look at who they are, and in some cases, what their lives are like because you guys have to make decisions every day that affect them. So we all worked together and made sure that this was a reflection of the kids that you so generously serve." 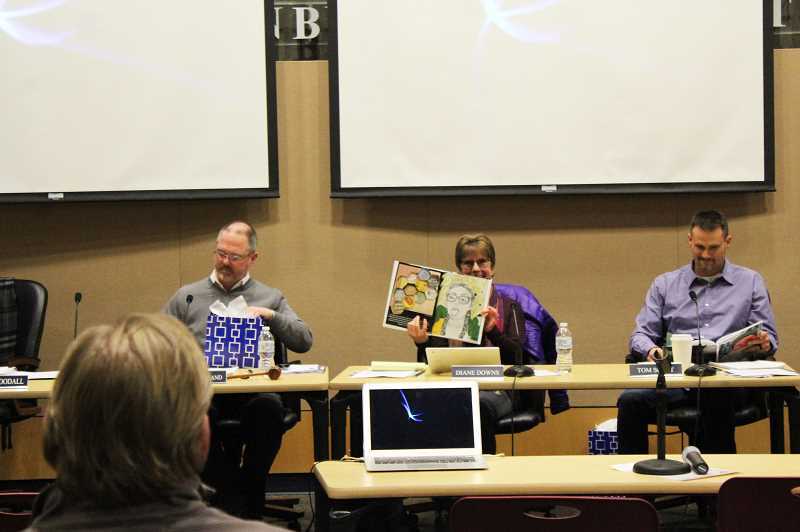 Board Chair Rob Sheveland was so impressed with the gift, he wondered at the book's potential. "Are these really just for us?" Sheveland said. "Are you going to sell these? You should sell these." All school boards are made up of unpaid, locally-elected members who govern public schools. They represent the community's beliefs and values, according to the National School Boards Assocation. Canby's board of directors meets twice every month for work sessions and regular sessions to discuss all things school-related. These meetings are open to the public. "I know I speak on behalf of this school district, but also the community, that we all know that this is not a position you all take lightly, that you take your responsibilities really seriously," Goodall said. "I've really enjoyed my time working with all of you, and I know, again, I speak on behalf of all of us. "So thank you for the time and energy you put in," he continued, "because I know it's really in your heart to serve, and that's what's really most important. So thank you." For specific information on the board and to view agendas or meeting minutes, visit the board website.